With an aim of showcasing cultural and artistic performances throughout the school year, the Cheryl Nelson Lossett arts series has Haimovitz and O’Riley booked as the start for a season of four shows. All are versatile performances, one of which (a ballet in March) is a world premiere event. Haimovitz and O’Riley’s concert “Shuffle. Play. 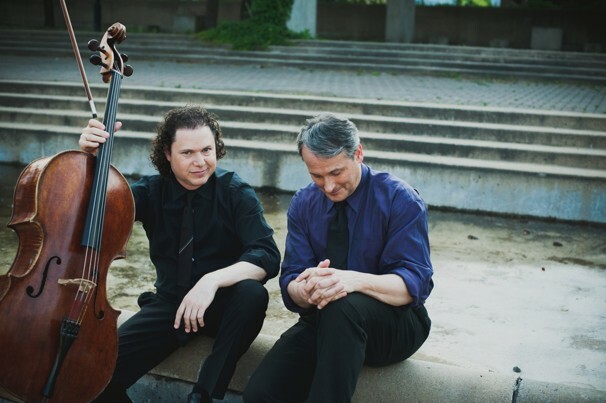 Listen.” is remarkable, because it is Haimovitz’s second appearance in the arts series and that the duo’s repertoire spans centuries and genres. Rebecca Sundet-Schoenwald, managing director of the arts series, headed a committee in booking the year’s performances and is pleased that Haimovitz is returning to MSUM, which will mark his third area appearance in nearly seven years. Haimovitz’s second appearance in Fargo-Moorhead was his first time with the Lossettarts series. He teamed up with violinist Andy Simionescu in autumn of 2008 for a sold-out show. “Audiences at Fargo-Moorhead Symphony Orchestra know him and love him, so I do expect a really good audience for this,” Sundet-Schoenwald said of the upcoming show. Haimovitz’s partner for “Shuffle. Play. Listen.,” Christopher O’Riley, has his own sphere of success as well, as he presents the double threat of being a radio host and classical pianist. “From the Top,” his NPR program, features young musicians and their emergent success. O’Riley’s pianist abilities are well-known and world-famous and have taken life on the many albums he has issued over the years. Together, Haimovitz and O’Riley will present two 45-minute sets that will feature a vast variety of music. From Bach to Arcade Fire, from Stravinsky to Radiohead, their repertoire covers an expanse of music. Their second set is interesting to note as it will not be planned until the musicians get an air for the room and decide what road to take for their MSUM audience. Those who cannot make their 7:30 p.m. show can find them earlier in the day on Sept. 19 as Haimovitz will be busking in downtown Fargo at noon that day at a secret location, while O’Riley will lead a piano master class at the Gaede Stage at 1 p.m.
“We’ve got three pianists for over a 90-minute period [and] so he’ll work with all three of them, and they’ll perform whatever they’ve worked out, ‘cause they’ve prepared, and then [O’Riley] goes back and they’ll work together a little bit more and then everyone can watch,” Sundet-Schoenwald said of O’Riley’s afternoon master class. Whether it is Haimovitz’s downtown flash performance, O’Riley’s piano master class, or their main show collaboration, Sept. 19 will be a day that area student musicians and classical music fans will not want to miss, as the Gaede Stage seats 330 and the show is expected to sell out. Matt Haimovitz and Christopher O’Riley present “Shuffle. Play. Listen.” at 7:30 p.m. Sept. 19 at MSUM’s Gaede Stage. Tickets are $28 for adults, $24 for seniors, MSUM alum and staff, $12 for non-MSUM students and $6 for MSUM students.